The Tuesday before Ash Wednesday is Carnival throughout Europe and the Americas. It is notably the Mardi Gras in New Orleans. 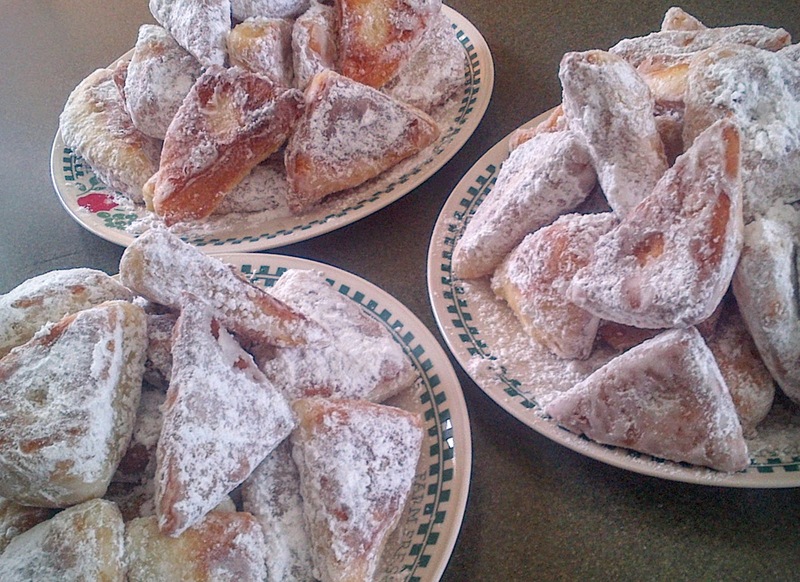 In Pennsylvania Dutch country, it is Shrove Tuesday, and it is also Fastnacht Day. Fastnachts are a special kind of doughnut. What better way to prepare for Lenten fasting than by using up all of the fat in a household in freshly made doughnuts? Warm doughnuts hold a special place in my childhood memory. Before the days of shopping malls, when we needed to buy clothes or if there was a big sale, it meant a trip to the city. Lancaster, Pennsylvania was not a very large city and its boundary was less than a mile from my childhood home, but it was a different world. It was a world of traffic, the smell of exhaust, and crowded sidewalks. A trip to the city also meant we were in for some treats. Men wearing Gatsby caps would stand by baskets selling warm, fresh, soft pretzels for a nickel. We called those hats “Pretzel Man Hats” because if we saw someone wearing one, they were usually accompanied by a basket of warm pretzels. When warm, fresh pretzels are being sold, you buy them and eat them on the spot. There was also a peanut roaster who had a fixed stand next to the Army-Navy Store. The smell of roasting peanuts beckoned down the street. We would get a bag of warm, freshly roasted nuts. Then there were doughnuts. The Woolworth’s Five and Ten Cent store had a bakery counter just inside the door from the street entrance. There is something magical about the smell of doughnuts being made. The store probably put the bakery in the front knowing the smell would draw customers right in. My mother or grandmother, whoever was chaperoning our trip, would leave us kids outside the store and would go in and buy us some fresh doughnuts. I liked cream filled with powdered sugar. A crisp fried crust covered with powdered sugar, puffy airy dough underneath, and filled with sweet fluffy cream. On Fastnacht Day, the doughnut thing goes to a whole new level. Doughnuts are everywhere. They are in the news and they are in your face. When I moved away from Lancaster, I decided to spread the joy of Fastnacht Day to my new home. Feed the sourdough starter to make sure it is active. Best to start this on Sunday night or first thing Monday morning. On Monday evening, warm the milk and potato and mix together in the bowl of a stand mixer. Add the sugar and butter. Mix to a smooth consistency. Add the active sourdough starter and one cup of the flour. Mix and let it rest in a warm place for 2 hours. Add the egg, salt, and about 3 cups of the flour. 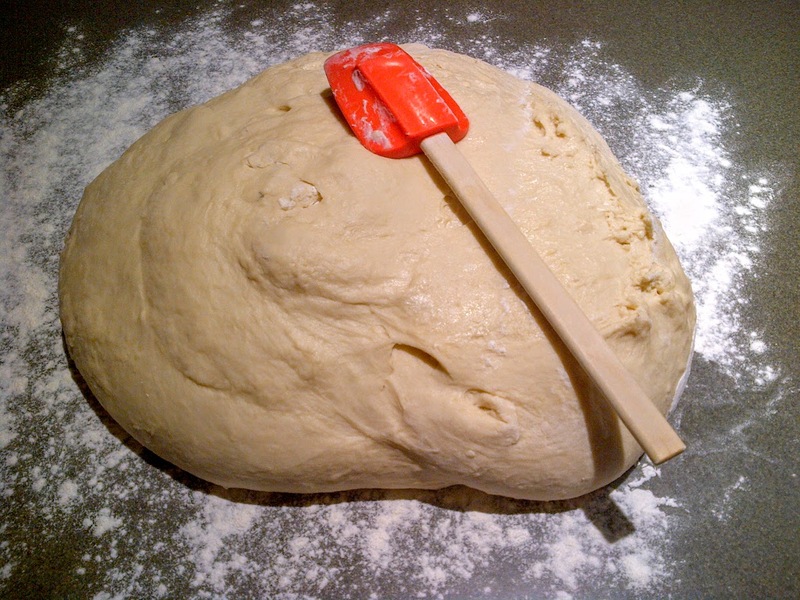 Using the dough hook of the mixer, knead until the dough is smooth. If it is still sticky, add more flour. When the dough is formed, remove it from the mixer bowl and knead by hand a little bit on a floured surface. Oil a clean bowl and place the dough in the bowl to rise. Cover with a damp cloth and set in a warm place for about 2 hours. 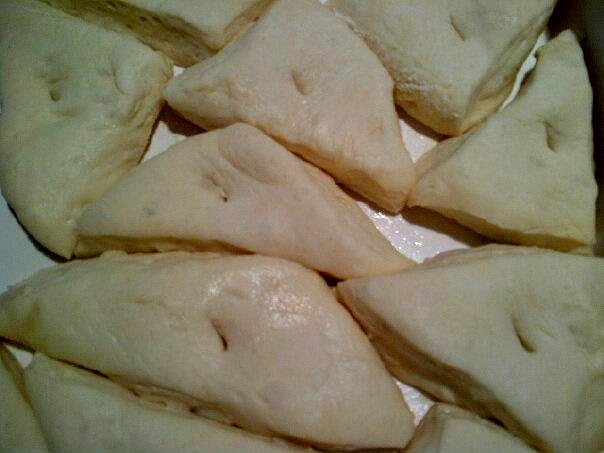 Roll the dough out on a floured surface to a thickness of about ½ inch and cut into 2 to 3 inch triangles. Set the triangles in lightly oiled proofing trays. Cover and stack the trays in a cool place overnight (I put them in the basement or an enclosed porch). Get up very early on Tuesday. Bring the trays of doughnuts into the warm kitchen. Using a sharp paring knife, poke a hole in the center of each triangle to make sure they cook through. 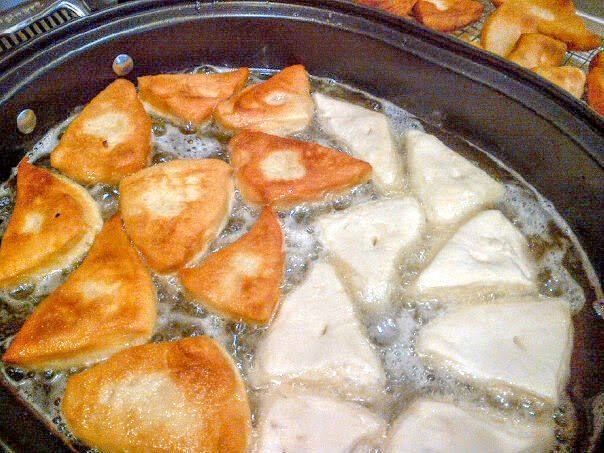 Heat the shortening to 375F in an electric skillet. Cover a counter with newspaper and then place layers of paper towels on top. Prepare a sheet pan with a rack to move the Fastnachts from the oil to the paper towels. Put several cups of powdered sugar in a large paper bag. 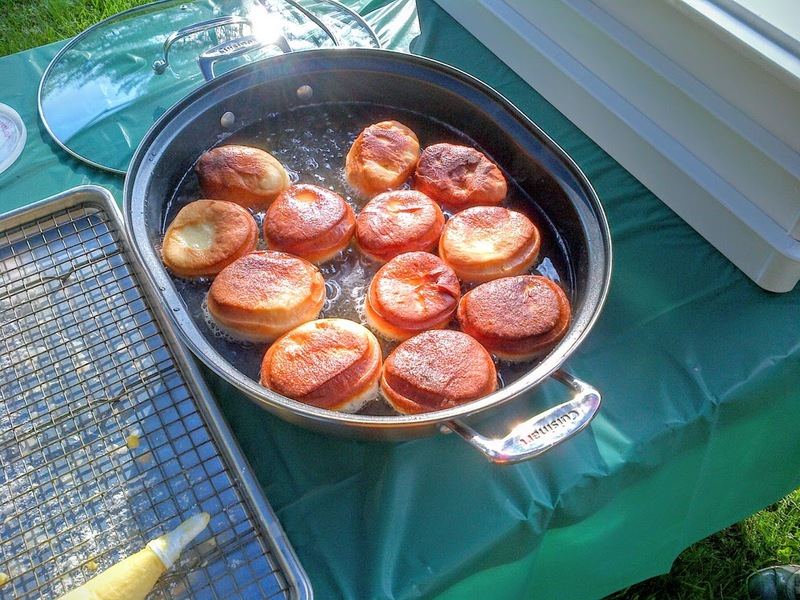 Start frying the doughnuts. Flip them over when one side is deep brown. As they are done, more them onto the baking rack. When the rack is full, dump them into the sugar bag. Give it a shake to coat, and then move the Fastnachts onto the paper towels to finish cooling. 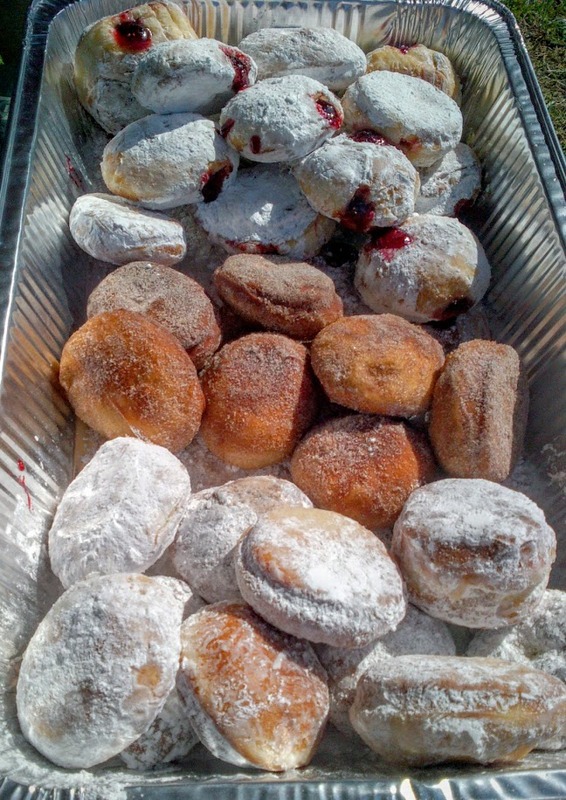 You might want to eat a few to make sure they are OK.
Of course, Fastnachts can be made on other days, too. They can be filled with jelly, pudding, or cream using a pastry bag. 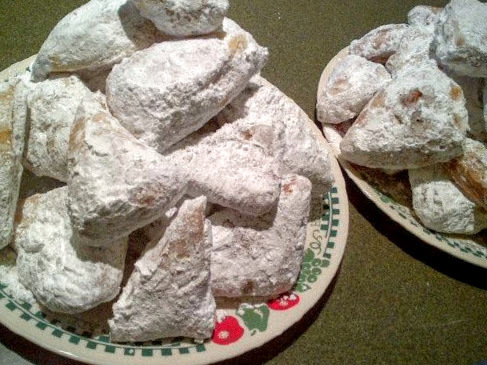 They can be coated with powdered sugar, granulated sugar, or sugar and cinnamon. I did this for a fund raiser, and we sold over a gross of assorted doughnuts in about 3 hours.